A once in a lifetime chance to explore, cook and eat in the Italian village of Castro dei Volsci. Professor Kolette Draegan leads a week-long a expedition in Italy that includes hand-on cooking instruction, authentic Italian meals, and excursions in the Italian countryside and seaside. 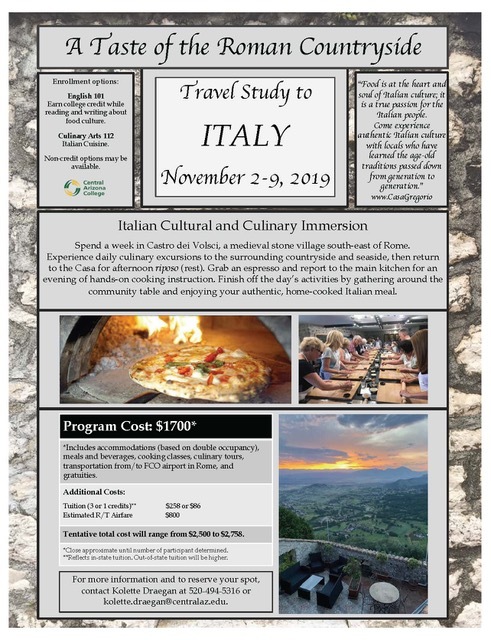 Students can earn 3 college credits by enrolling in English 101 while reading and writing about food culture and/or 1 college credit by enrolling in Culinary Arts 112/Italian Cuisine while participating in this travel study program. Participants may also enroll as a non-credit student via our Community Education program. Below are some frequently asked questions but feel free to contact Professor Draegan to reserve your spot or ask questions: 520-494-5316 or kolette.draegan@centralaz.edu. 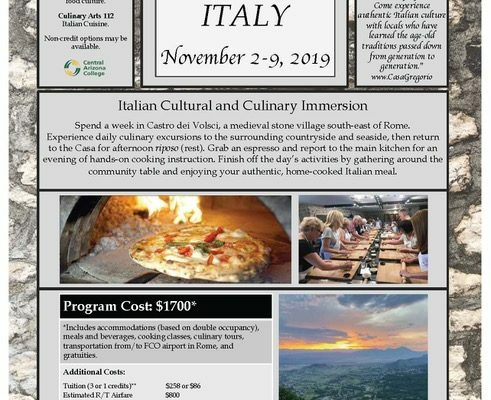 To reserve a spot in the Program, participants need to determine which way they want to participate (English 101 and/or Culinary Arts 112, or Community Education), complete the Participant Profile, and provide a $300 non-refundable deposit. Signups are on a first-come-first-served basis by following the process described above. There are limited numbers of spots for each of the three ways to participate. Once those spots are taken, signups will close. If they do not fill, the final date to sign up and submit a deposit is August 1st, 2019. -$300 deposit is required to reserve a spot in the program and is applied toward the Program cost. -$700 is due no later than May 1st, 2019. -$700 is due no later than August 1st, 2019. Participants will purchase airfare on their own once notified by Program coordinator. This is paid directly to the airline or travel agent. Paid to the College, tuition is due at the time of registration (tuition payment plans available from the cashier’s office). Using your financial aid award to cover Program costs may be possible, if you enroll in one of the courses and it fulfills a requirement for your degree or certificate program. To determine whether or not you can use your financial aid, you will need to meet with a financial aid advisor. Can I make monthly payments or set up a payment plan? The only payment plan is the one outlined above in ‘How do I pay for the Program’. This program is developed and organized “in house,” which means there is no third-party company taking payments. However, you may speak with the cashier’s office regarding a payment plan for tuition. Yes, all participants will need to obtain a valid passport. A visa is not required. Please visit the U.S. Department of State’s website for information on applying for a passport, fees and timelines. Allow 4-6 weeks for routine passport processing. Can the Program accommodate dietary restrictions? Yes, Casa Gregorio is able to accommodate for most dietary restrictions. Please contact Professor Draegan for specific cases. Luxury rooms. Assignments based on double occupancy with either one king or two single beds. Can I extend my stay in Italy? Yes, absolutely! If you choose to arrive in Rome early, there are two options for getting to Casa Gregorio: 1. Be at the airport in Rome at the pre-determined meeting time, or 2. Take the train to Frosinone station (about 1 ½ hour ride from Rome). If you choose to extend your stay in Italy after the program, plan to do so either from Frosinone train station or FCO airport in Rome. There are plenty of transportation options between Rome and FCO airport.